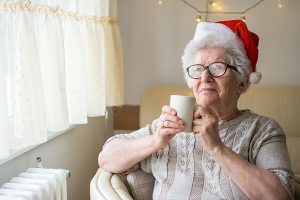 Help yourself, or the senior loved in your life experience this year’s holiday season with happiness and joy by beating the holiday blues. Ah, the holidays: they are oftentimes the most wonderful time of the year, or the most difficult. For many seniors in the Boston area who have lost relatives, are battling chronic health conditions, or are suffering from isolation and loneliness, the holiday season can result in depression. And, the family caregivers who care for a loved one may also be prone to holiday blues, as a result of an overabundance of stress. Seek medical help. Above all, it is crucial to pass along any suspected indications of depression (modifications to sleeping and eating behaviors, not enough interest in previously enjoyed hobbies and socialization, sluggishness and constant despair) to your elderly loved one’s (or your) primary care physician. You can find excellent treatment options readily available, plus it’s critical to rule out other health issues. Make wholesome choices. With the amount of high-fat, high-sugar, high-salt food products readily available throughout the holiday season, it’s relatively easy to let a balanced and healthy diet slip and overindulge. But eating unhealthy, along with consuming too much alcohol, can cause feelings of depression. It is also important to obtain sufficient sleep; eight hours is ideal for most adults. Create new traditions. Frequently for aging parents, holiday traditions have had to be modified over time. Starting a new normal isn’t usually easy, but it may lead to a renewed interest in holiday festivities. Try joining in a night of caroling, a shopping and lunch outing at a brand new location, going to your neighborhood high school’s holiday play or performance, etc. Reminisce. Rather than steering clear of emotionally charged discussions about lost family members or past holidays, urge the senior to share memories, and take sufficient time to pay attention and engage in the conversation. Looking through photos or watching home movies often helps the senior process the loss and start to move ahead toward acceptance and comfort. Help another. Nothing boosts our spirits quite like knowing we have helped somebody else. Seek out opportunities for your elderly loved one to volunteer in some way to help people in need: baking cookies for a nearby homeless shelter, buying small toys and gifts to deliver to the children’s hospital, putting together care packages for people in the military, etc. For further tips to encourage your elderly loved one to stay active and engaged during the holidays and all year long, call North River Home Care’s home care experts. Our fully trained caregivers are knowledgeable in assisting older adults to live life to the fullest, and we’re here for you with as much or as little help and support as required. Call us at 781.659.1366 to learn more.